Paul Hicks, regional coordinator for Global Water Initiative, an international coalition that includes Catholic Relief Services, visited this woman and many like her during the study leading up to the Oct. 9 release of “Tortillas on the Roaster.” Hicks estimated Central Americans who farm to support only their families make up about 50 percent of Central American farmers. Because of a predicted 1 degree Celsius temperature increase by 2020, these corn and bean farmers in Central America could be in danger, says “Tortillas on the Roaster.” The climate change, if not adapted to, will increase poverty levels for Central American families as well as increase the immigration rate, says the report, published by CRS, which led several international organizations in the study. He said Guatemalans are more likely to migrate into the wetlands rather than leave the country altogether. In a telephone interview with Catholic News Service, Hicks relayed a conversation he had with the Honduran woman. “‘This is the food my family has to depend on,’ she told me,” Hicks said. “Tortillas on the Roaster” shows detailed climate projections and effects on corn and beans in Guatemala, Honduras, Nicaragua and El Salvador. It suggests the production of these crops could be increased despite the present shortage if local farmers learn to manage water and farm more efficiently and use seeds that better withstand dry heat. If measures are not taken to help famers utilize plants water and soil to their advantage, Hicks said, food security will be in jeopardy for rural families, affecting generations to come. “As their productivity decreases they will be forced to buy additional food, causing less funds for education and health services and other basic needs,” he said. Hicks said government involvement, private donations, and “shoulder-to-shoulder cooperation” are needed. “There is an urgent need to act. What’s needed is the government to commit to this solution in the immediate future and make those long-term commitments with a clear vision for agricultural development in these countries,” said Hicks. The study looked at detailed projections until 2050. Honduras and El Salvador will be most affected by the reduction in corn growth, especially in areas that already have bad soil. Honduras is projected to have about a 30 percent decrease in corn production in those areas by 2050. El Salvador will lose more than 32 percent production in such areas. Nicaragua and Guatemala will lose about 11 percent by 2050. Bean production in the region will decrease by about 25 percent by 2050. This could lead to about $125 million yearly loss for the region by 2020. 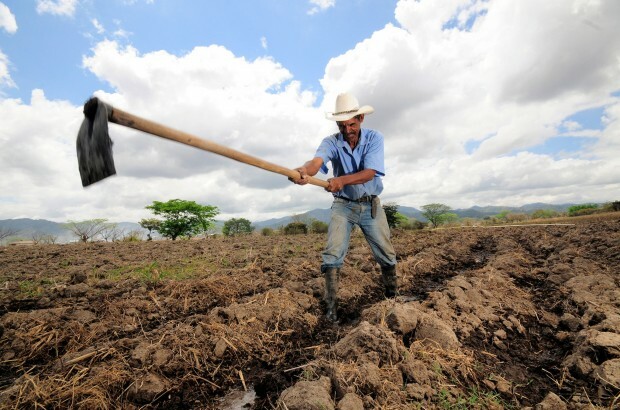 “More than 1 million farm families depend on the cultivation of maize and/or beans for their subsistence,” says the study, which noted that beans and rice are the foundation for Central Americans’ diets.